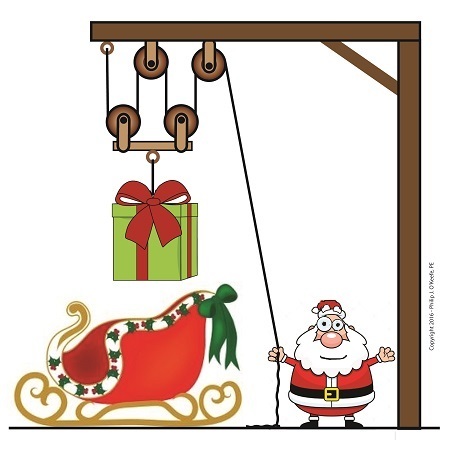 Happy Holidays from EngineeringExpert.net, LLC and the Engineering Expert Witness Blog. Last time we introduced the engineering concept of mechanical advantage, MA. 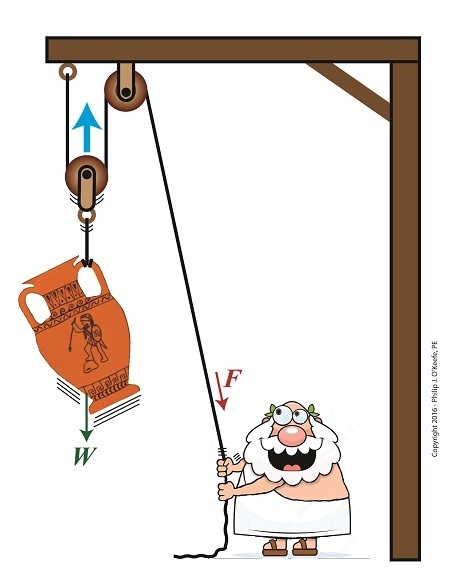 Thanks to its presence in our compound pulley arrangement, it made a Grecian man’s job of holding an urn suspended in space twice as easy as compared to when he used a mere simple pulley. Today we’ll see what happens when our static scenario becomes active through dynamic lifting and how it affects his efforts. If the urn weighs 40 pounds, then he only needs to exert 20 Lbs of personal effort to keep it suspended. where F represents a bicep force of at least 20 pounds. Fortunately for him, his efforts will never have to extend much beyond 20 Lbs of effort to lift the urn to the beam. That’s because gravity’s effect will remain nearly constant as the urn climbs, this being due to gravity’s influence upon objects decreasing by an insignificant amount over short distances above the Earth’s surface. As a matter of fact, at an altitude of 3,280 feet, gravity’s pull decreases by a mere 0.2 %. The net result is that the compound pulley enables the same mechanical advantage whether a static or dynamic scenario exists, that is, regardless of whether Mr. Toga is simply holding the urn stationary in space or he’s actively tugging on his end of the rope to lift it higher. Next time we’ll see how mechanical advantage increases when we add more fixed and moveable pulleys to our compound pulley arrangement. 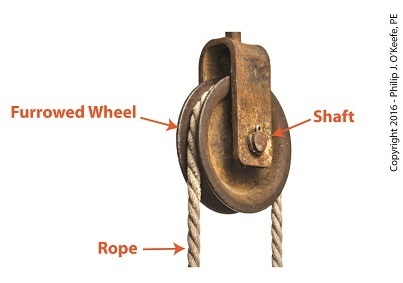 Last time we introduced the compound pulley and saw how it improved upon a simple pulley, both of which I’ve engaged in my work as an engineering expert. 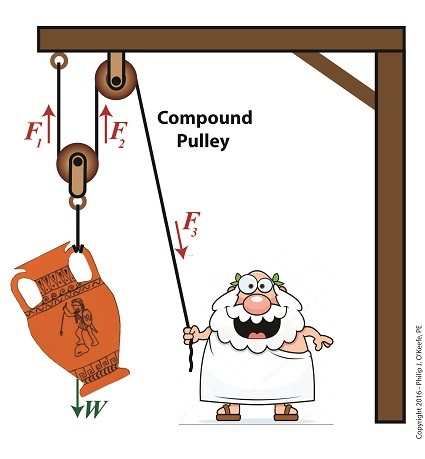 Today we’ll examine the math behind the compound pulley. We’ll begin with a static representation and follow up with an active one in our next blog. The compound pulley illustrated below contains three rope sections with three representative tension forces, F1, F2, and F3. Together, these three forces work to offset the weight, W, of a suspended urn weighing 40 lbs. Weight itself is a downward pulling force due to the effects of gravity. To determine how our pulley scenario affects the man holding his section of rope and exerting force F3, we must first calculate the tension forces F1 and F2. To do so, we’ll use a free body diagram, shown in the green box, to display the forces’ relationship to one another. The free body diagram only takes into consideration the forces inside the green box, namely F1, F2, and W.
Because we know F1 and F2, we also know the value of F3, thanks to an engineering rule concerning pulleys. That is, when a single rope is used to support an object with pulleys, the tension force in each section of rope must be equal along the entire length of the rope, which means F1 = F2 = F3. 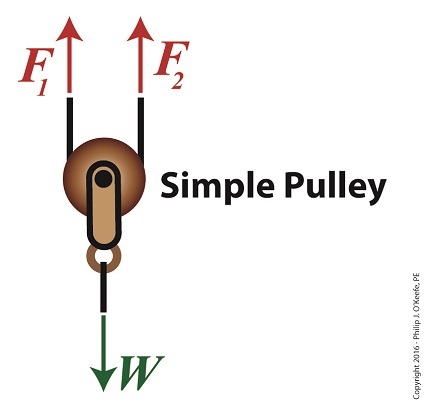 This rule holds true whether the rope is threaded through one simple pulley or a complex array of fixed and moveable simple pulleys within a compound pulley. If it wasn’t true, then unequal tension along the rope sections would result in some sections being taut and others limp, which would result in a situation which would not make lifting the urn any easier and thereby defeat the purpose of using pulleys. Mr. 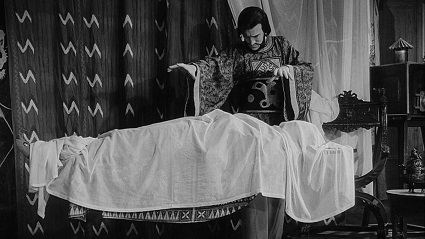 Toga needs to exert a mere 20 pounds of personal effort to keep the immobile urn suspended above the ground. It’s the same effort he exerted when using the improved simple pulley in a previous blog, but this time he can do it from the comfort and safety of standing on the ground. Next time we’ll examine the math and mechanics behind an active compound pulley and see how movement affects F1 , F2 , and F3. 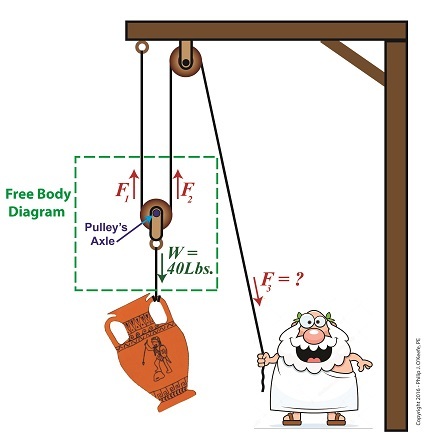 Last time we introduced the free body diagram, applied it to a simple pulley, and discovered that in so doing lifting objects required 50% less effort. As an engineering expert, I’ve sometimes put this improved version of a simple pulley to work for me in designs. We’ll do the math behind the improvement today. Here again is the free body diagram showing the improved simple pulley as introduced last week. The illustration shows the three forces, F1, F2, and W, acting upon the simple pulley within the highlighted free body diagram. Forces F1 and F2 are exerted from above and act in opposition to the downward pull of gravity, represented by the weight of the urn, W. Forces F1 and F2 are produced by that which holds onto either end of the rope that’s threaded through the pulley. In our case those forces are supplied by a man in a toga and a beam. By engineering convention, these upward forces, F1 and F2, are considered positive, while the downward force, W, is negative. 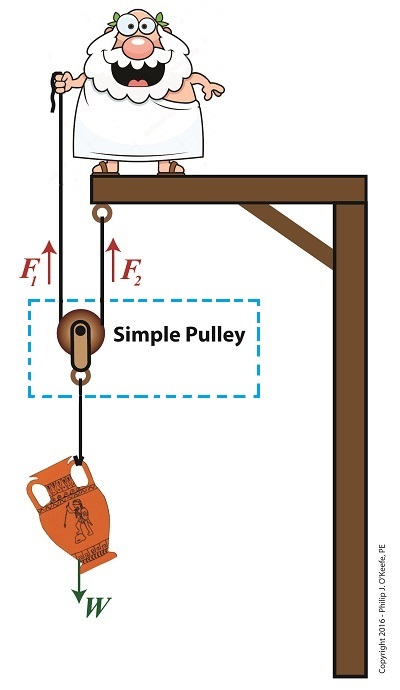 In the arrangement shown in our illustration, the pulley’s rope ends equally support the urn’s weight, as demonstrated by the fact that the urn remains stationary in space, neither moving up nor down. In other words, forces F1 and F2 are equal. If the sum of the forces in a free body diagram do not equal zero, then the suspended object will move in space. In our situation the urn moves up if our toga-clad friend pulls on his end of the rope, and it moves down if Mr. Toga reduces his grip and allows the rope to slide through his hand under the influence of gravity. The net real world benefit to our Grecian friend is that the urn’s 20-pound weight is divided equally between him and the beam. He need only apply a force of 10 pounds to keep the urn suspended. Next time we’ll see how the improved simple pulley we’ve discussed today led to the development of the compound pulley, which enabled heavier objects to be lifted. Sometimes the simplest alteration in design results in a huge improvement, a truth I’ve discovered more than a few times during my years as an engineering expert. Last time we introduced the simple pulley and revealed that its usefulness was limited to the strength of the pulling force behind it. Hundreds of years ago that force was most often supplied by a man and his biceps. But ancient Greeks found an ingenious and simple way around this limitation, which we’ll highlight today by way of a modern design engineer’s tool, the free body diagram. 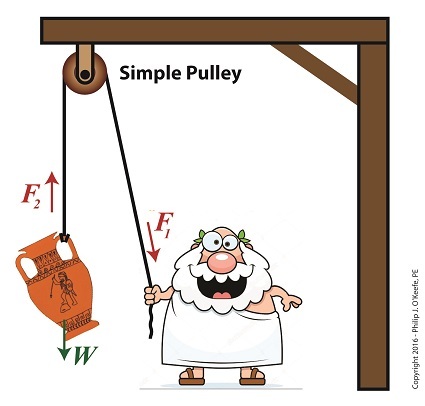 Around 400 BC, the Greeks noticed that if they detached the simple pulley from the beam it was affixed to in our last blog and instead allowed it to be suspended in space with one of its rope ends fastened to a beam, the other rope end to a pulling force, something interesting happened. It was much easier to lift objects while suspended in air. As a matter of fact, it took 50% less effort. To understand why, let’s examine what engineers call a free body diagram of the pulley in our application, as shown in the blue inset box and in greater detail below. The blue insert box in the first illustration highlights the subject at hand. A free body diagram helps engineers analyze forces acting upon a stationary object suspended in space. The forces acting upon the object, in our case a simple pulley, represent both positive and negative values. The free body diagram above indicates that forces pointing up are, by engineering convention, considered to be positive, while downward forces are negative. The basic rule of all free body diagrams is that in order for an object to remain suspended in a fixed position in space, the sum of all forces acting upon it must equal zero. We’ll see how the free body diagram concept is instrumental in understanding the improvement upon the action of a simple pulley next time, when we attack the math behind it. Lifting heavy objects into position always presents a challenge, whether it’s a mom lifting a toddler to her hip or a construction worker lifting work materials to great heights. During my career as an engineering expert I’ve dealt with similar challenges, some of which were handled quite nicely by incorporating a simple pulley, which we introduced last time, into my design. But sometimes, due to certain restrictions, the addition of a simple pulley into the works isn’t enough to get the job done. We’ll take a look at one of the restrictions working against the use of a simple pulley today. The simple pulley is believed to have first been used by the Greeks as far back as the 9th Century BC. Back then it would have come in handy to lift cargo aboard ships, hoist sails on masts, and lift building materials high off the ground to supply workmen during the construction of temples and other marvels of ancient architecture. In other words, pulleys literally saved ancient workers thousands of steps when it came to lifting things off the ground. Let’s return to ancient times for a moment to get an understanding of the mechanics behind the workings of the simple pulley as put to use in a basic lifting application. 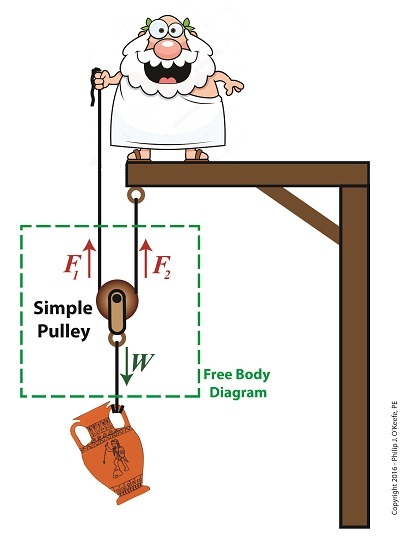 With a simple pulley, the tension force F1 applied to the rope by the pull-er is equal to the tension force F2 exerted upon the object, the pull-ee. Once lifted off the ground, these forces are also equal to the object’s weight, W, which gravity works upon to return the lifted object to its previous position on the ground. All these forces come to bear upon whatever’s doing the pulling. If this pull-er happens to be a human, then the simple pulley’s effectiveness to lift things is directly proportionate to that human’s strength. In the case of the toga’d figure above, that would be about 10 pounds. It’s this caveat that limits the usefulness of the simple pulley when relying on human power alone, particularly when it’s employed to lift extremely heavy objects like marble pillars. A single human isn’t up to the task. Next time we’ll see how ancient Greeks overcame this limitation of the simple pulley by managing to cut in half the amount of brute force required to lift heavy objects. Pulleys are simple devices with many uses, and as an engineering expert, I’ve often incorporated them into mechanical designs. They’re used in machinery to transmit mechanical power from electric motors and engines to devices like blowers and pumps. Another common usage for pulleys is to aid in lifting. There are two types of pulleys for this purpose, simple or compound. We’ll start our discussion off by looking at the simple type today. The simple pulley may have been an advanced application of the wheel. It consists of a furrowed wheel on a shaft with some device for pulling threaded through it. The pulley wheel supports and guides the movement of a rope, cable, or other pulling device around its circumference. The pulling device runs between a pull-ee and pull-er, that is, the object to be moved and the source of pulling power, with the pulley itself situated somewhere between them. Pulleys are believed to have first been used by the Greeks as early as the 9th Century BC. We’ll look into how they put them to use next time. Ever seen that old movie where they’re lifting a grand piano to the top floor of a tall building with ropes? The huge piano dangles precariously in mid air by the ropes, which are attached to a rather simple looking wheeled device that’s situated at the top of the building. As men on the ground tug on the ropes, they hoist the piano higher and higher by increments of inches as the wheeled device the rope is threaded through spins madly. The piano’s formidable size appears to magically levitate off the ground, like in the famous magician’s trick. That object with the spinning wheel is a pulley, a rather simple device which I as an engineering expert have often made use of in my designs. We’ll be talking about the various types of pulleys and their uses in future blogs, beginning with an exploration of a simple pulley. As an engineering expert, I often use the fact that formulas share a single common factor in order to set them equal to each other, which enables me to solve for a variable contained within one of them. 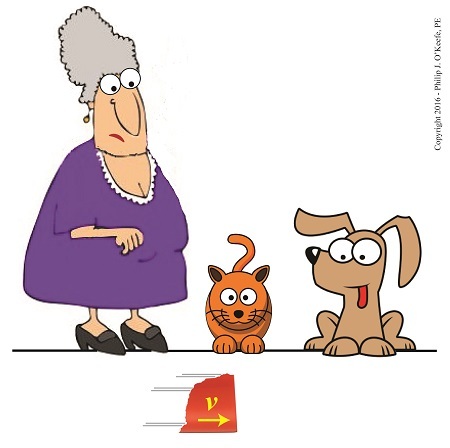 Using this approach we’ll calculate the velocity, or speed, at which the broken bit of ceramic from the coffee mug we’ve been following slides across the floor until it’s finally brought to a stop by friction between it and the floor. We’ll do so by combining two equations which each solve for kinetic energy in their own way. and we found that it stopped its movement across the floor when it had traveled a distance, d, of 2 meters. We also solved for the frictional force, FF, which hampered its free travel, and found that quantity to be 0.35 kilogram-meters/second2. Thus the kinetic energy contained within that piece was calculated to be 0.70 kilogram-meters2/second2. Of the variables present in this formula, we know the mass, m, of the piece is equal to 0.09 kilograms. Knowing this quantity and the value derived for KE from formula (1), we’ll substitute known values into formula (2) and solve for v, the velocity, or traveling speed, of the piece at the beginning of its slide. Our mug piece therefore began its slide across the floor at about the speed of an experienced jogger. This ends our series on the interrelationship of energy and work. Next time we’ll begin a new topic, namely, how pulleys make the work of lifting objects and driving machines easier.